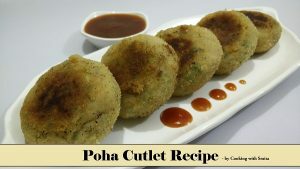 Today I am sharing an easy and healthy recipe of Leftover Rice Cutlet made from leftover Rice. You can also use freshly cooked Rice in case you don’t have leftover rice, make sure freshly cooked rice are dry and at room temperature. 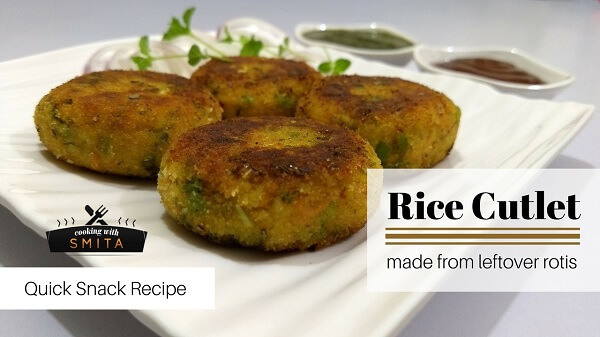 Leftover Rice cutlet is so delicious and healthy too as you can add finely chopped vegetables which are available in your kitchen. I have already shared a recipe of Rice Balls, in which I used leftover Rice. Rice Cutlets are different from Rice Balls as I have added Potatoes. One more difference it that Rice Cutlets are shallow fried in less Oil, hence making a healthy dish. Rice Cutlets coated with flavoured Breadcrumbs makes it crispy outside and soft inside. Add boiled Potatoes in a large bowl and mash using a masher, add cooked leftover Rice and mash together. Add vegetables – Capsicum, Carrot, Coriander, Green Chillies and Cabbage. Also add Ginger paste, Chaat Masala, Turmeric Powder, Red Chilli Powder and Salt. Add Corn Flour as required and mix well with your hand. Take a small portion of the mixture in hand and try to make a small size ball, flatten it with your palm and make flat patties. If it cannot hold the shape, add some more Corn Flour and mix again. Prepare medium size flat patties from the mixture. Coat all the Cutlets with Breadcrumbs one by one. Heat 2 tbsp. Oil in a pan over medium-high heat. When Oil is hot, place the cutlets in the pan and shallow fry until they turn golden brown at the bottom. Flip over the cutlets and shallow fry from the other side till it turns golden brown. When done, remove from pan and place cutlets over the paper napkin to remove excess oil. Shallow fry remaining cutlets in the same way. Serve hot Leftover Rice Cutlet with Tomato Sauce or Chutney. Garnish with Onion rings and fresh Mint while serving. Add 1 tsp. Chilli Flakes and 1 tsp. Oregano in ½ cup Breadcrumbs to make flavoured Breadcrumbs. Add less Salt while making the dough as Cooked Rice already contains Salt. You can deep fry the Cutlets until golden brown to save time.